This Spring Tour started on the 11th of March. We left Tokyo at 2 pm for Matsumoto (Nagano) with new suitcases on good wheels, packed with CDs, sound equipment, instruments and clothes. From there to Gifu, Kansai, Kyushu, Shikoku and Shizuoka, planning to come back to Tokyo on the 1st of April. We enjoyed again the fresh mountain air, the delicious cooking, and the warm welcoming atmosphere of Au Crieur. 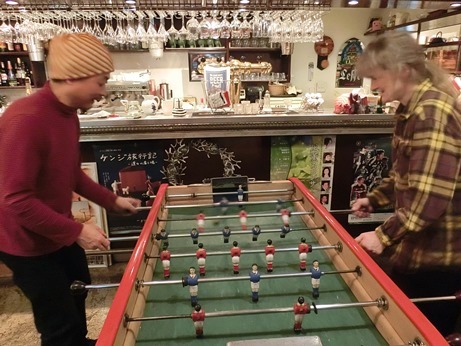 In the breaks, we played baby-foot with clients, waiters and the owner. It reminded Bix of her childhood. Au Crieur had recently got it sent from France by boat. You need to put 1 Franc into it to get the balls. Beautiful evening of our first day on the Tour. The owner had just come back from France where he had studied various new recipes and wine. Everybody listened carefully to our music while eating and drinking his good cuisine. The gourmet people, the place and the cooking goes well with our music. Wonderful second evening of the Tour..
We were very happy to see Ikuko again. She studies French, is a member of the Gifrance Association and will soon go to stay for a few weeks with our friends Julie and Issei in France, near Perpignan. She had studied our songs, sang with us and told us that she could easily remember the words with the music. Thank you so much Feliz for filming us ! It was raining and it was cold… Before playing, Philippe put on Fado music (traditional songs from Portugal) and it made a nice opening mood… Suddenly four childhood friends of Marki's came. They hadn't seen each other for years. A great evening in this artistic setting (all made by Philippe) of this French bar in the center of Kyoto. We love this old wooden house and the warm sound it gives out. Yet another childhood friend of Marki's brought 9 people of his company to see us, after work. The musicians of the other group were very nice as well. We played in the lobby and listeners gathered little by little around us, people we wouldn't have met otherwise. A girl of 16 asked us if we could come and play in her mother's coffee shop. Of course yes ! We gave her our card. Thank you to the ferry boat company to give us the chance to play and to travel to Kyushu ! Oomuta was one of the biggest coal mining areas between the 1930s and 1990s. We played next to the old mines in the fashionable, Meiji-European-style house of the Mitsui board of directors. The evening and the setting were beautiful. In between our songs, we played a love song for a newly married couple in their 50s. 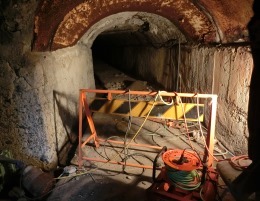 The next day we went to visit the mines, accompanied by an older man who had worked there as a miner. We heard the story of the lives of the miners, how hard it was. 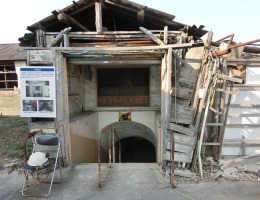 The mine museum is created by the miners themselves, with almost no financial support. 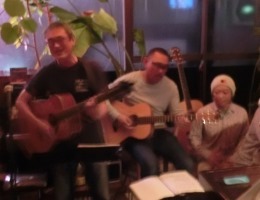 We played for sweet toddlers and their Mums, in this warm-hearted coffee-shop, a meeting point for younger couples who live in Oomuta (some of them came back to Oomuta after years in big cities). Oomuta inhabitants want to make the city revive. We also met a painter making a beautiful wall painting in the street. She had come from Kumamoto, had looked for a wall to decorate, found out who was the owner of the abandoned house, contacted him and got the permission to paint the wall. Bix gave a little French course before the concert and the concert was very well organized by M. Ozono, with wine and French food while listening to our music. Some children wanted to try to play the instruments, which was great. M. Ozono made a demonstration of Venenciador (the art of pouring Sherry into a glass), with his son, while Marki played Spanish guitar. Fantastic. We got a day off the next day and we went to visit the Chiran Tokko Heiwa Kaikan. (between April and August 1945 half of the 1000 young boys who were sent to pilot themselves into the ships of the enemy started their flight from there). There is a sanctuary next to it. It was very sad and impressive. We went there by bus, and then continued to Ibusuki. We took a hot sand bath at the beach and a bath in the hot spring. Bix gave a French lesson before the concert. 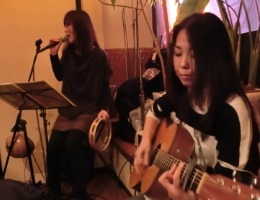 Thanks to the consistent artistic activities of café Brassens, many of the people who came to the concert were themselves artists, painters, photographers, a doll-maker, and the winner of the classical flute Japanese contest for junior high school students was also there. Café Brassens is a wonderful literary and artistic café. We arrived at noon and went to have a delicious curry at Kuronekoya, then tried to find a cable for the mini-mixer we use for sound amplification, which we found at last. In the evening, we played for a dancing audience ! The floor and counter is made of a special wood that makes the sound velvet like. We had got a message from Wam am café, that our live due in the afternoon of the 24th was canceled due to a fire in the café. We went there when we arrived in Oita, and it was very sad. Everything was gone. There had apparently been a shortcircuit of electric cables. We think of the owners very much. Life can change so suddenly. The organizer of our concert last year had opened his own bar in the center of Oita. It is hard to start a new business, but his idea was clear, a space for music and art. A group of young jazz musicians played the opening act of our concert. It was refreshing to hear standard jazz tunes ! Katsura Yamauchi, a saxophonist and an artist whom we organized a concert for in Brussels years ago, came too. We spoke about the importance of having your own philosophy of life. Music takes time, money, and there is no actual space for it. We took a ferry-boat to cross over to Shikoku for 3 hours, a taxi to the station, a local train, a minibus and arrived at Roy's, a lovely place with old antiques, furniture, armchairs, posters of jazz men, photographs... It was like stepping into another world. Lots of people came. Bix connected the objets she saw with our music. A wonderful evening with wonderful people. We are grateful to the owner that he also introduced us to 2 other places in Shikoku. 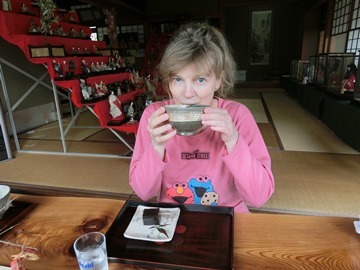 We took a small rest with a cup of green tea and a piece of japanese cake, when we arrived at Takahashi Tei, the beautiful old wooden house where we were going to stay overnight. Takahashi-tei was Mr.Ryutaro Takahasi's house. He contributed to introduce beer, football and baseball to Japan. it is now a great accommodation house in traditional Japanese style. We were invited to come to the annual Easter Party of a sweet little school. The children and their Mums were not so used to speaking with a foreigner. In the evening, we played for people of all ages. Two ladies we had met the day before at in Roy's came this time too, with a friend … We had a great time. A saxophone player played a couple of standard tunes with us, and so did the owner of Kanade, on his guitar. 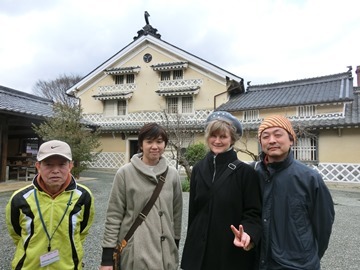 The English teacher of the school is also a member of the Uchiko volunteer guide association. Together with the former English teacher of the local High School she guided us the next morning in Uchiko, telling us about the Kabuki theatre, the wax industry, calligraphy and literature. It was a great pleasure to exchange ideas with them about cultures and languages. Uwajima is a port town in the South of Shikoku. We played in a rock bar, with a great rocker audience each one with his own personality, skin-head, hippie clothes etc. The next day we went with the organizer to eat fish in the old fish market. The castle on the hill was beautiful. Playing music and doing events in this town where fewer and fewer people live seemed more important than ever. We met 3 Swiss people at the station and invited them to our concert in the evening. The place was packed with people and everyone tried to learn French (the Japanese) and Japanese (the Swiss). It was a great musical-cultural evening, also with two local bands playing. We suggested to the owner to make a menu in roman alphabet, and maybe to ask the Tourist Office at the station to make a little more indications in English for tourists who might want to stay over in town. It is actually very difficult to get around because everything is in Japanese, outside the station. Imabari is a popular destination to doing cycling and visiting the castle .. Painted walls, ceiling, floor... objets, antiques, a mirror instead of a door... the artist owner had transformed her old grand mother's house into a fairy tale house. Cookies, cakes, healthy food... The audience listened carefully to us. All ages, young, older. The owner of Le Puy came with his girlfriend. A dancer invited us to play next time in her studio café in a village close by, the same happened with the owner of a piano bar downtown. We really felt the importance of bringing life to the town. The little salon-café on the ground floor of the Alliance Française was so sweet, with its French flag curtains and pink chairs... Lots of people came, French students and France lovers. The Committee of the Alliance invited us to dinner and we spoke with them and the director, the only French man in the school, about how to develop more interest in the French culture. It was our first time in Tokushima and we will definitely come back ! This beautiful bistrot café is situated near the foreign quarter, a little higher up on the hill. The family running the café was very kind. The audience was wonderful. Our friends came even from Nagoya, thank you to you all ! It was lively and nice. A French artist Ivan Sigg drew us while playing. The couscous was great. This little French school situated in a sweet street with European style shops, is on the ground floor of a wooden house, nicely decorated. Around 10 French language students listened to us and we talked with them in between and after the songs, especially about music and poetry. A little girl of 5 had lived in Brussels and spoke in French with us. It was the last concert of our Tour ! Very charming indeed. 20 concerts in 22 days allowed us to fully appreciate the warm welcome of all these places where small cultural and musical events can bring people together. Fortunately we didn't get sick and didn't have any big problems even though the schedule was tight and it was hard to carry luggage, instruments and equipment by hand, in trains, on the streets and from hotel to hotel. Our music seemed to strengthen itself in the harmony of our two voices, enveloping with our rhythms very diverse audiences. We experienced many contrasts of lifestyle and philosophy of life. Playing our music here and there made us feel like a small pipe of energy coming from a place far away sharing a part of a big dream.